Joe Louis Arena, home of the Detroit Red Wings and nicknamed “The Joe,” opened back in 1979 and is the fourth oldest venue in the NHL. Over the years, the venue has hosted concerts from numerous bands and artists from the 80s, 90s and today. Concerts that have been staged at the venue include the following: Reo Speedwagon (10 times); Prince (9 times); Neil Diamond (7 times); Bruce Springsteen & The E Street Band (6 times); Journey; Def Leppard; AC/DC; Bon Jovi; Hall & Oates; Foo Fighters and Fleetwood Mac. This spring and summer, a few notable shows will take place at Joe Louis Arena: Fleetwood Mac on June 12; Justin Bieber on July 28 and the America’s Most Wanted Tour with Lil Wayne, T.I. and Future on August 9. With tours being announced on a daily basis these days, you can probably expect Joe Louis Arena to be added to the route of a few more this summer. Tickets for all concerts as well as all other events at Joe Louis Arena this spring and summer can be found right here at SeatGeek. 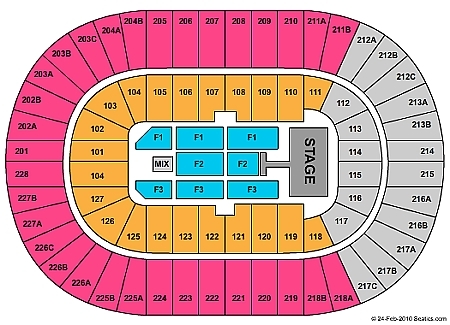 For a look at the seating chart for concerts at Joe Louis Arena, check out the image below. The venue seats 21,666 patrons for concerts.